Black ballpoint pen is accented with goldtone clip and trim ring with the old Intel logo on it's barrel. Comes with black velvet slip case. 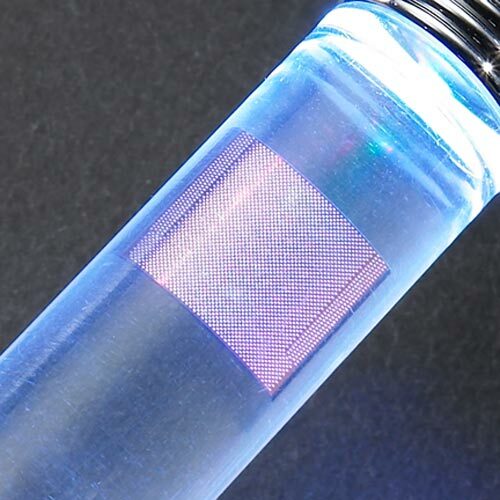 This pen features an actual Intel CPU chip floating in the pen's translucent barrel illuminated by brightly colored LED lights. Ball point; black ink. Changes colors in Blue, yellow, red, and green. Blue barrel and trim with chrome clip and accents w/ Intel logo. Comes new, sealed in original package. Intel ask ES (employee services) pen used as an internal awareness to the employee services program. Metalic Silver colored plastic pen wth Intel logo features black rubber ergonomic grips. Secure Intel was an internal campaign. Intel was promoting Information Asset Security Awareness. Intel Mechanical pencil with new Intel logo. Blue Intel logo pen with clear rubber ergonomic grip.